Ah, the wisdom of Pooh. I used to love it when my Dad used to take us to Pooh Bridge, to play Pooh Sticks. Timely thought of the day as I just finished reading “the tao of pooh” great stuff….. So true and so simple. Great thought for a (rainy in Boston) Sunday. I saw you at Cath Lawson. I like Pooh. I also read a book called The Tao Of Pooh — it’s sometimes in the humor section, but it’s actually a very good book on taoism. @Dave – Pooh Bridge to play Pooh Sticks – fun!! I’ve played similar games with my kids, but without the bridge. It’s always fun to race those sticks! @Chris – Zen to Fitness — Well, I haven’t heard of that book, but it sounds excellent. I’ll have to check it out! @Akemi – That’s the second time today I’ve heard about the book “The Tao of Pooh”. I need to check it out! Thanks for the heads up (along with Chris). these Sunday quotes are one my joys, Lanceman! I hope you will allow me to include this in my next blog carnival, CelebraZine (Celebrate What’s Right in the World). aww…a quote on the lighter side today! I love it! I can’t remember which pooh movie it was, but I cried. I get all gushy for pooh! I like to compare the hubby with Eyore! Annettes last blog post..Happy Birthday Jacob! Sounds like a great self-fulfilling prophecy to me! I have always loved this quote by Christopher Robin, and it’s something that every parent should say to their child. Imagine what the world would be like if everyone was taught to see their strengths and told that people have faith in them. Thanks Lance. And I enjoyed your interview at MizFit. I really like this picture of Pooh. It looks like he’s having a good time with the shells. Everyone need a friend like Christopher Robin. @CG – I’m really glad you enjoy them! And, you are certainly welcome to include them in Celabrazine blog carnival – that’s awesome, thanks!! @Annette – I have this feeling my wife would compare me to Eeyore too! I’m trying to be more like Tigger, though! @Kelly – Yes! If we could all just pass this on to our children, what a magnificent gift we’d be giving them. Your thought here makes me wonder how well I’m doing at this with my own children…I’ll make sure they know! @Ellen – Yep, I like the picture too. And, with friends like Christopher Robin, we’d all be a little more confident in our own abilities, wouldn’t we. I love Winnie the Pooh!! So do my kids! What a classic. What a great way to silence the negative voices inside our heads! Vered – MomGrinds last blog post..Almost-Wordless Wednesday: Correct Your Nose Without Operation! I love Poo… I mean Pooh. I read “The Tao of Pooh” last year as well. It was good. (I did not like the “Te of Piglet,” however. Writer Dads last blog post..The Ninth Wonder? That quote reminds me of what we should all be telling our children. Positive affirmations are SO important. A lovely thought to take into dream world tonight before I start a new week! @Evelyn – Hey, I’m glad to hear it – he’s one pretty cool bear! @Writer Dad – Ha! I know you love Poo, errr, Pooh!! Wow, another who has read the “Tao of Pooh”. Again, I’ve got to check it out. “The Te of Piglet” – first I’ve heard of this one (I had to look it up). I’ll stick to the first…. @Linda – Happy dreams! And, with thoughts of Pooh Bear, you can’t go wrong! Sure it’s a lovely sentiment and makes me stop and think too, but I can’t help but fret about that Pooh sat on the beach, a pebble beach at that, and wonder if his owner is around if it’s he’s been left or if he’s just been put there for the picture. Tell me he was OK and went home to his cosy place on the end of someone’s bed . . .
@Tara: Don’t be afraid – Pooh is okay. We had a very good time in NZ, and this year we both walked up to to top of the Kilimanjaro Mountain. He was in much better conditions then me – no problems with the height. 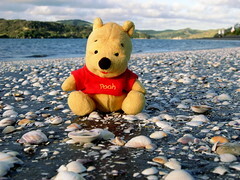 Pooh is a strong bear – and I never would do things with him, he did’nt like. (Sorry for my english, I hope, you understand). That’s a lovely quote – something we all should remember. Lance, I think Tara has been at the sugar again. Hehehe. Last night I read “Grandpa Toad’s Secret” to my son, which ends w/ Grandpa Toad telling his grandson…”You were brave. You were smart. You were wonderful.” It’s nice to know many children’s books are spreading the same messages. Many folks self-judge way too much. They call it the “not enough syndrome.” These are some very wise words to live by. Knowing these things about yourself takes care of a lot of potential judgment. Awesome to contemplate on! No need for more words! BC Doans last blog post..Support "Train For Humanity"
@Glee Girl – Grover on the beach, that sounds lovely! I’d like to be taking the picture, because then I’d be at the beach!! @Dave – I think I’ve reassured her that Pooh is ok! @BC – Yes, I agree, thanks for stopping by! * PHP detects that cookies appear to be enabled. Great thought! We love Pooh in our house! Thanks for your comment today. It was great reading how you play piano to feel uplifted. It is amazing how much power music really has. @Workout Mommy – Christopher Robin is smart, Pooh is cute – how can you go wrong!! @Glen – I’ll check things out on this end and see if anything is going on, thanks for the heads up. @Munchkins and Music – Winnie the Pooh is great. Unfortunately all of our kids have “outgrown” him…so I don’t hear many Pooh stories anymore. So this was fun. And, yes I find music to be very uplifting – thanks for sharing your insights on music! @Marelisa – I’m recalling some of them now in my head. They were great stories. Like I said to Munchkins and Music, our kids have all outgrown Winnie the Pooh. And he was a great bear, especially with all his friends. Great stories. I’m sure your niece appreciates those beanie babies now. That’s a nice way to keep them alive in your heart. Having someone have faith in us makes a huge difference, doesn’t it! Thanks Lance. I think this quote is something we all need to keep in our back pockets. It works so well for most everything! @Robin – When someone believes in us, that is such a huge thing! What confidence it gives us!